Arbor Day is an awesome day: what a great idea it is to make a holiday just for planting trees! 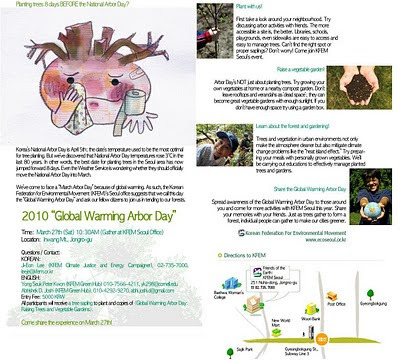 Sure, Korea's not the only place that observes Arbor day, but here in Korea it's on April 5th. Now, Korea's accomplishment in reforesting pretty much their entire country, after it had been razed by the Korean war, is an environmental side of Korea's post-war history that rarely gets told, next to the oft-trumpeted economic "miracle," but it's part of the story, folks. Arbor Day is no longer a national red-letter day, but people still remember it, and this year, there's a sweet event happening near downtown Seoul. On March 27, near Gwanghwamun Station (line 3) there's a tree planting event on Inwang Mountain (one of my favorites). This is the kind of community event that I think expats should be finding out about, and joining. So readers, I'm planning to go there on the 27th, and plant some trees. If you want to join me, let me know! I'll be writing about it on the 2S2 Blog as well, and you can let me know if you want to come from the 2S2 Facebook Group. Click on the picture for the full-size version. I'll actually be in Seoul on the 27th (I think - if I don't get the wrong month!) so maybe I'll try to plant some trees too! Yay!